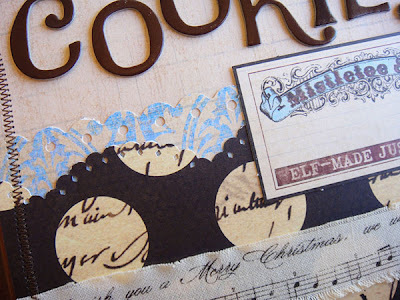 Welcome to the ScrapTiffany Holiday Blog Hop. We are so excited to share our Holiday Ideas with you on Monday and Tuesday this week. You should have arrived here from Laurel’s blog. If you arrived here first, head back to the ScrapTiffany blog. I am so excited to finally share this project with you. Every year around Chirstmas I do some holiday baking. I always make the same line up of treats, but every year I end up hunting around for my recipes. I needed to get them all in one place. 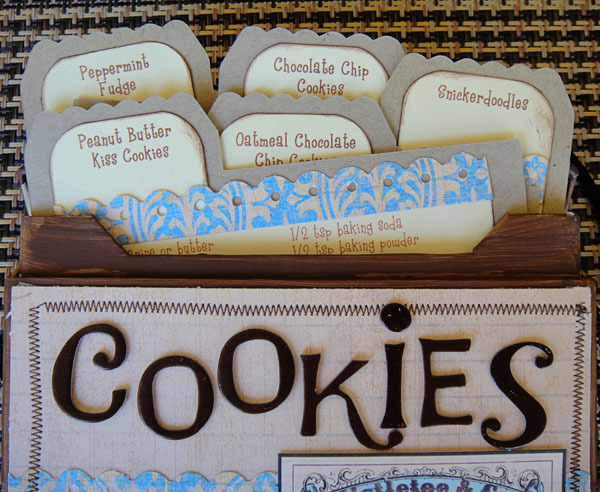 I had this box leftover from a mini album project and it was the perfect size for a recipe box. I used some Pink Paislee and some fabulous music note fabric from a Color Me Daisy kit (no longer available). 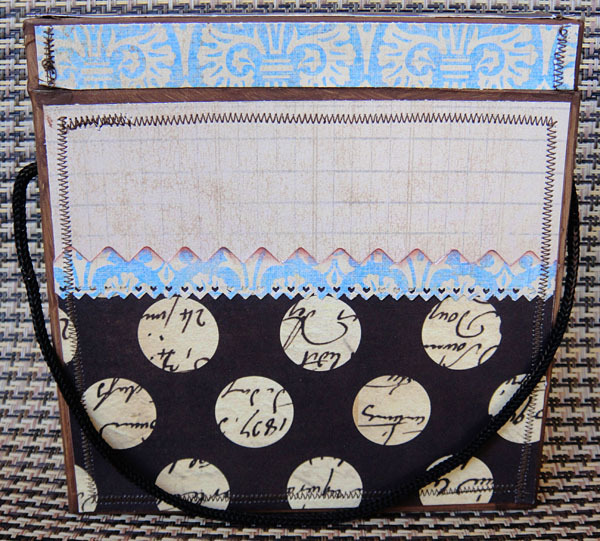 I added American Crafts Thickers, a splash of paint, a dab of ink, a trip through the sewing machine, some punching and the outside of my box was decorated…. And what would a recipe be without a yummy picture. On the backside of the recipe card I added a picture, a couple of paper strips and another tab. Thanks for visiting me for the ScrapTiffany Holiday Blog Hop. Leave a comment telling me what your favorite holiday treat is and I will draw a name to receive a box of some scrappy goodies that will include some things I have left from a few past Studio Calico and Mosh Posh kits, as well as some holiday scrappy goodies. The next stop on the ScrapTiffany Blog Hop tour is Norazah. Michelle~ My girls and my son all get together each year and bake Cookies for the holiday. I always think of making each one of them something like this. Thanks for the idea! That is so stinkin' cute! What a great idea! mmmm can we try those cookies?!?! I love your idea!!!! Great job!!! Cute, cute, cute! I just love this fun idea & am going to tuck it away to use later. Red Velvet Cake is a must for Christmas! Love your recipe file! What a great idea 🙂 I just used that paper too, love it! Love this idea Michelle! So cute! Your cookies look delish too! awesome….I just started taking pictures of my food to do a recipe book…my favorite holiday treat has to be the buckeyes!!! Oh, I LOVE this project. I just have to try it out. Would make great gifts for the holidays. Thank you for giving me great inspiration. Michelle, I love your recipe holder! Not only is it so useful; it's so pretty as well!! Thank you for sharing!! Oh, I forgot to tell you what my favorite holiday goodie is. I love potato pancakes with sour cream and applesauce! Yum!! so so cute. my favorite holiday treat is sweet potato pie. Perfect Michelle!! I love the idea of having my recipes in one spot. I don't know why I fight with that every year. This project is a must for me. Great job!! The cookies look great too!! 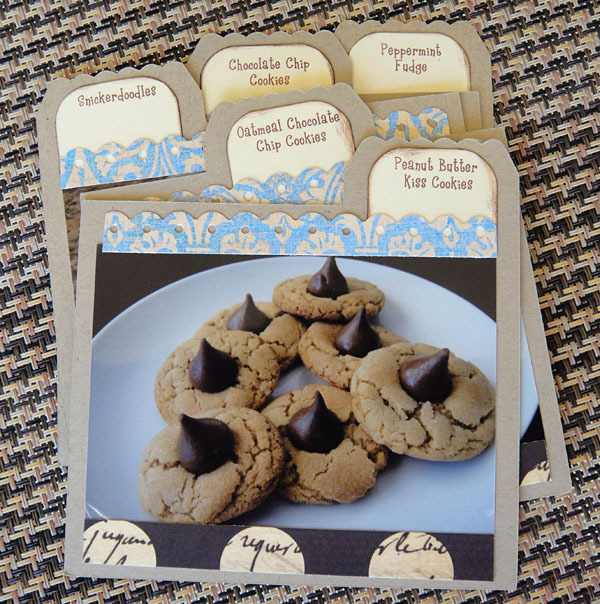 My favorite is cookies but especially the Peanut Blossum kisses…yummy! Great idea – fabulous project! I love the day my mother and I get togeather with my girls and make christmas cookies- we make about 6-8 diff. kinds and freeze them We LOVE this day fun with the girls! Adorable project! I love cookies- especially thumb prints! Great project. My favorite treat is fruitcake cookies – unfortunately I'm the only one in the family that likes them so I don't make them every year. My moms homemade peanut butter cookies are one of my many favs. TFS and inspiring us for the holidays! What a great idea Michelle, I should really do something like this for myself! This came out so awesome! It would make such a fabulous gift too!! I love this box, too cute, and the colors are great! Thank you for sharing. My favorite treat for the holidays is my grandmother's homemade hot chocolate. with a hint of cinamion, and Tamales! Your project is adorable! Looks like it took a lot of work. My favourite Christmas treat is a refrigerator cookie made with almonds and cherries. Yum! I love your recipe box! I hate digging through a recipe box as well especially when it's jam packed! No pun intended! lol My favorite Christmas treat is a tie between Peanut Butter Balls and Pecan Pie! Great project! 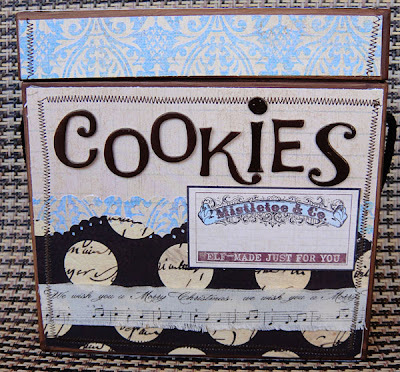 Cookie recipes def deserve their own special box!! I think I will have to borrow this idea for gifts for the cookie exchange I participate in! I love chocolate truffles & those peanut butter cookies w/ kisses. Love that you have that one pictured, yummm! My favorite christmas treat is frosted shaped sugar cookies and my grandmother's peanut butter roll candy. Great idea to include a photo! I bought some Christmas cookie cutters today so I'll be making some cookies this year. My favourite treat is the yummy stone fruit available this time of year in Australia. Oh I love this! My favorite treat is homemade Almond Roca. Love your fabulous recipe box, Michelle! Just beautiful. I am so going to steal this for a gift for my cookie exchange. Thanks for sharing. Great project. My favorite treat is sugar cookies. Oh this is too cool! I would love to make one for my sister! I love anything sweet at this time of the yr, but since I have been married (18 yrs) I have always helped my mother in law make Tamales, it has become my favorite time for the holidays, cant wait till she lets me "take them over"
LOVE this! My favorite holiday cookie is Pecan Pie Cookies for sure! This project is super awesome!!! The colors ROCK and I would love to make these for Christmas gifts. What a fabulous idea. Thanks so much for sharing!!! Stop by and visit my blog sometime. Love this would be great for a housewarming gift. Thanks for sharing. My favorite holiday treat are the pizelles I used to make with my grandma and mom. Also Rosettas too. YUM! I've been having so much fun seeing all the fun christmas projects on this blog hop, i even bought some paper today. great inspiration from you all (or perhaps a bad influence… i'll go with inspiration. ha ha). I LOVE your recipe box idea just for those special items. SO CUTE! 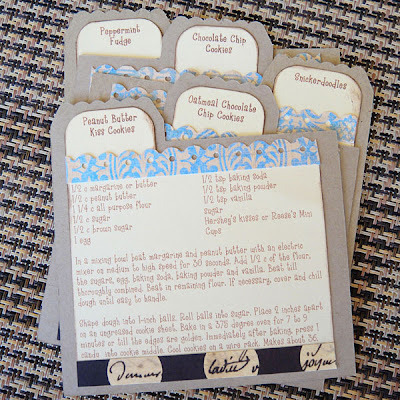 I love how you've got such great photos to go along with your recipe cards – what a darling gift idea. Great job!!! What a cute idea, TFS!